The Red Hot Chili Peppers returned to the road this week to start the North American leg of their “I’m With You” world tour. The shows were supposed to begin in January, but things were postponed due to multiple foot injuries sustained by singer Anthony Kiedis. Anthony underwent surgery to remove a crushed sesamoid bone and correct a detached flexor tendon in his foot and is expected to make a full recovery. 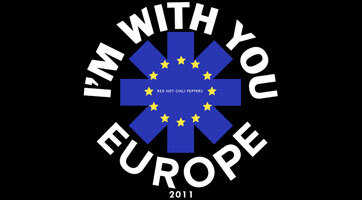 To mark the band’s return to the stage, the Peppers are offering fans a free live EP from their 2011 European dates. Drummer Chad Smith handpicked the tracks for the EP, which you can download for free here.